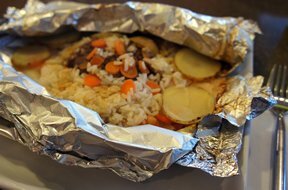 Foil packets for each individual. Allows each person to create their own, based on their taste preferences. Use any seasonal vegetables, from zucchini, onion and squash. Leftover rice is also a great addition. Combine soup and broth together. 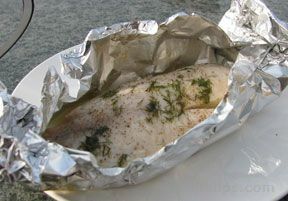 Place each chicken piece on a large foil piece. Season chicken. Surround chicken with vegetables. Add some soup mixture on top. Cover and seal with foil. Bake 60 minutes at 350° in oven. NOTE: These can also be done on a medium-high grill during the summertime heat. "Great flavor! I used seasoned salt with rice, carrots and celery. With the heat wave, I grilled the packets. 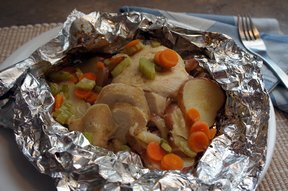 As with any packet dinners, I add a strip of bacon on the bottom of the foil. 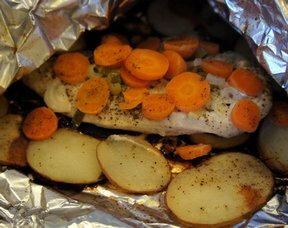 It adds flavor and fat to prevent burning."